FAT (File Allocation Table) - The FAT file system has its origins in the late 1970s and early 1980s and was the file system supported by the Microsoft MS-DOS operating system. It was originally developed as a simple file system suitable for floppy disk drives less than 500K in size. Over time it has been enhanced to support larger and larger media. Currently there are three FAT file system types: FAT12, FAT16 and FAT32. The basic difference in these FAT sub types, and the reason for the names, is the size, in bits, of the entries in the actual FAT structure on the disk. There are 12 bits in a FAT12 FAT entry, 16 bits in a FAT16 FAT entry and 32 bits in a FAT32 FAT entry. Fault Tolerance - describes a computer system or component designed so that, in the event that a component fails, a backup component or procedure can immediately take its place with no loss of service. Fault tolerance can be provided with software, or embedded in hardware, or provided by some combination. Some levels of RAID are an example of fault tolerance. FHSS (Frequency-Hopping Spread Spectrum) - Frequency-hopping spread spectrum (FHSS) is a method of transmitting radio signals by rapidly switching a carrier among many frequency channels, using a pseudorandom sequence known to both transmitter and receiver. Multiple systems can operate using the same sequence, however, the chance of collisions increases as more and more users use the same sequence. 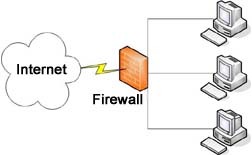 Firewall - Either a hardware or software entity (or a combination of both) that protects a network by stopping network traffic from passing through it. In most cases, a firewall is placed on the network to allow all internal traffic to leave the network (email to the outside world, web access, etc. ), but stop unwanted traffic from the outside world from entering the internal network. This is achieved by granting and denying access to various ports. Firewire (IEEE-1394) - A very fast external bus similar to USB that supports data transfer rates of up to 400 Mbps. Firewire was developed by Apple and falls under the IEEE 1394 standard. Also known as the High Performance Serial Bus, firewire can connect up to 63 devices in a tree-like daisy chain configuration. 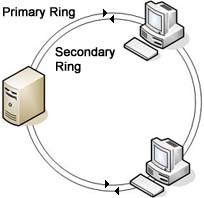 It supports plug-and-play and peer-to-peer communication between computers. Flash - Developed by Macromedia and now owned by Adobe, Flash is used to create vector graphics-based animation programs that are small enough to stream across a normal modem connection. In order for a web browser to display Flash animation, a plug-in must be installed on the user's system. Flash Drives - Flash drives offer advantages over other portable storage devices and are partially responsible for the disappearance of floppy and ZIP disk technologies. They are more compact, generally faster, hold more data, and are more reliable due to both their lack of moving parts (solid state), and their more durable design. These types of drives use the USB mass storage standard, and therefore, can be used with Linux, Mac OS X, Unix, and Windows. The drive is simply plugged into the computer's USB port and it registers as removable storage in My Computer (Windows). Newer computer systems will also allow these drives to be selected as the boot device which can be useful for storing certain utilities and troubleshooting tools. In Windows Vista, the ReadyBoost feature allows use of a flash drive to supplement system memory. At the time of this writing there are flash drives with a storage capacity of up to 64 gigabytes. Frame Relay - Frame Relay is the successor to X.25 and is a high speed WAN protocol operating at the physical and data link layers. Frame Relay is a packet switching technology that was originally designed to run on ISDN interfaces, but can now run on T-carrier systems. This technology operates at speeds in between the range of 56 Kbps to 45 Mbps (T-3), and can transmit voice and data. To some degree, this technology is being displaced by broadband cable and DSL technologies. FSMO Roles (Flexible Single Master Operation Roles) - To prevent update conflicts, Active Directory performs updates to certain objects in a single-master fashion. In a single-master network model, only one domain controller in an Active Directory handles updates. Windows 2000 Active Directory extends the single-master model to include multiple roles and the ability to transfer roles to any DC. Since an Active Directory role is not bound to a single DC, it is referred to as a Flexible Single Master Operation role. There are five FSMO roles which are Schema Master, Domain Naming Master, RID Master, PDC Emulator, and Infrastructure Daemon. FTP (File Transfer Protocol) - FTP is a member of the Internet Protocol suite and the primary method of transferring files over the Internet. An FTP client can upload or download files from an FTP server regardless of the operating systems involved. As a user, you can use FTP with a simple command line interface or with a commercial program that offers a graphical user interface such as WS_FTP or Cute FTP. Two transfer modes are used in FTP. ASCII and BINARY. ASCII mode is used for the transfer of files consisting of plain text while the BINARY mode is used all types of files not consisting of plain text (such as sound, video, executables, images etc). Failure to upload files in the proper format can corrupt them.